Knowledge of diet is critical in interpreting the ecological roles of marine top predators and provides information towards their conservation and management. The Falkland Islands hold the largest number of breeding gentoo penguins. Yet knowledge of gentoo penguin diet at the Falklands is limited to either broad taxonomic divisions of prey items or dietary samples collected only on a single day. 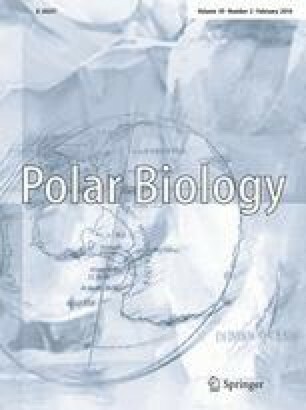 This study is the first to investigate gentoo penguin diet at Cow Bay, Falklands, to the species level, over repeated sampling intervals during the breeding period. Through stomach content analysis, we determined diet over a large temporal scale (2002/2003/2004–2011/2012/2013) and between the guard and crèche periods of chick rearing. The principle prey item by reconstituted mass was rock cod fish Patagonotothen spp., for all periods (47–78 %) except that of the 2012/2013 crèche period (19 %) when Falkland herring Sprattus fugensis made up the bulk of the diet (52 %). Of the cephalopods recovered, Patagonian squid Doryteuthis gahi was prominent (1–24 %), while crustaceans contributed negligibly to gentoo penguin diet. Our findings revealed that gentoo penguins breeding at the Falkland Islands were primarily demersal foragers with an ability for pelagic feeding. Diet choice appears to reflect prey availability. The online version of this article (doi: 10.1007/s00300-015-1781-1) contains supplementary material, which is available to authorized users. This project was generously supported by the Rufford Small Grants Foundation, John Cheek Trust, Falkland Islands Environmental Planning Department, and Nelson Mandela Metropolitan University Research Capacity Department. Additional stipends were provided by the National Research Foundation of South Africa. Special thanks to Zhanna Shcherbich and staff of the Falkland Islands Fisheries Department, and Dr. Yves Cherel (CNRS, France) for assistance in sample identification. We are grateful to Jan Cheek and wardens of Johnsons Harbour for access to the study colony. We are extremely thankful to the volunteers who assisted with sample collection.